A BINONDO LEGEND. 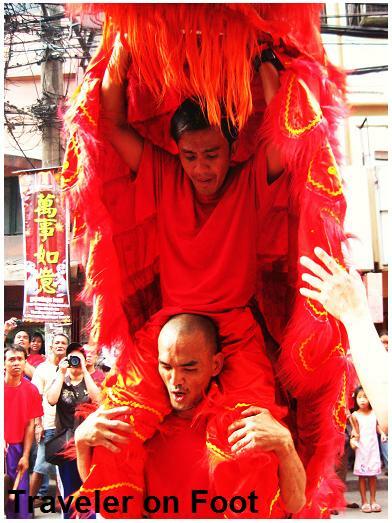 One of Binondo’s legends revolves around the venerated image of the Santo Cristo de Longos. The Cofradia de Sto. Cristo de Longos handed over a brief history of the Cristo. The story goes that in the 16th century a deaf-mute Chinese was drawing water from a well in the barrio of Longos. When he pulled out the pail, he found a blackened corpus, an image of the crucified Christ. He began shouting about his discovery as he miraculously gain his speech. The parish priest fitted the image with a cross and brought it the Capilla de San Gabriel. The venerated image stayed their until the earthquake of 1863 destroyed the chapel. The miraculous Cristo was found unscathed under the rubble and was brought to Binondo Church. STO. CRISTO DE LONGOS. The original image of the Santo Cristo is displayed in a glass-covered niche near the side entrance of church of Binondo. A shrine located in San Nicholas District was built on the site of the old well of barrio Longos where the miraculous image of Christ was found by the deaf-mute Chinese. The main street of the old barrio of Longos was named Santo Cristo. STREET-SIDE TEMPLE. Along the main road of Manila’s Chinatown, a street-side temple was built. Here people come to burn joss sticks, make offerings, and recite a prayer to the Sto. Cristo de Longos. CHINESE NEW YEAR. From the moment we walked under the Arch of Goodwill, it was clear that it was festival day. The regular noise from vehicles passing Plaza Sta. Cruz was replaced by the sounds of thundering drumbeats and clang-clang of cymbals, an indicator that we are close to seeing for the second time the Dancing Dragons and Lions in Binondo. 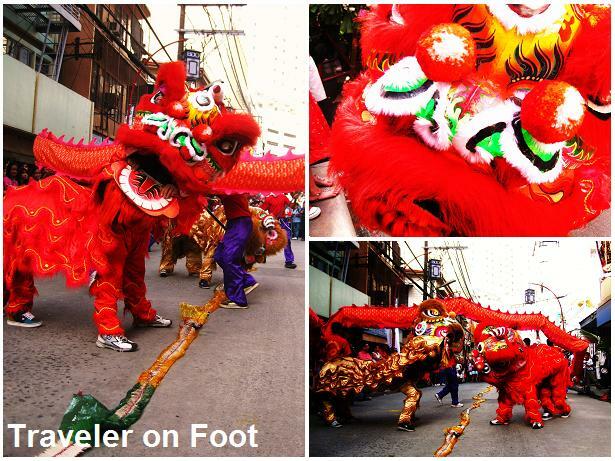 Every first day of the lunar year, Ongpin Street and the major streets of Manila’s Chinatown are filled with spectators watching dragon and lion dance performances. Like in most Chinatowns around the world, they are the major elements of the Chinese New Year Tradition. CHINESE NEW YEAR TRADITION. The Chinese has a deeply rooted cultural legacy in the Philippines. Historical records reveal that the Chinese were living peacefully with the ancient Filipinos for centuries even before the arrival of the Spaniards in 1521. They introduced not only goods and technology from their homeland but also their traditions and customs. Some of these ancient customs survived through the years and have blended with the Filipino culture. BINONDO. In the 16th century, the Chinatown in Binondo was founded, making it one of the oldest Chinatowns in world. For the next 400 years, Binondo has become the economic and cultural center of the Chinese community in the Philippines. Thus, it is in Binondo where we thought it’s best to celebrate the Chinese New Year. LUNAR CALENDAR. For the Chinese, the New Year of the Lunar Calendar is the most important and the first of the four traditional festivals of the year. But unlike the January 1 New Year, which follows the Gregorian calendar, the Chinese New Year has no fixed date. 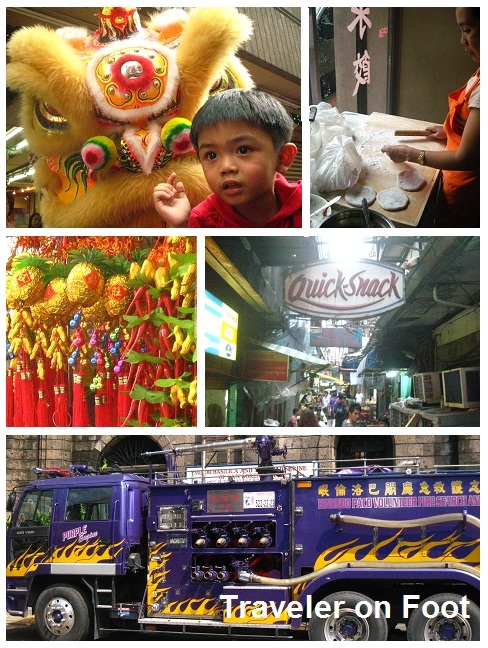 For example, the first time we went to Binondo for the 2008 celebration, new year fell on February 7. In 2011, new year was celebrated on February 3. The dates of the Chinese New Year may change but not the festival elements like driving away bad spirit through loud firecrackers and dancing dragons. ENTER THE DRAGON. We were approaching midway of the kilometer-long Ongpin Street, when we saw a dragon dance being staged. Our effort of inching our way through the thick crowd for a front seat has paid off as we watched the dragon dancers demonstrate their coordinated steps and alternating movement, making the mythical creature come to life by waltzing the poles holding the slender body of the dragon up and down then making swift swirling motion, taking the cue from the beat of the drums. FIRECRACKERS. Soon the long firecracker belt was set off. Each deafening blast caused the crowd to scramble away from the scene but the dragon kept twirling and dancing around the frightening and smoky staging area. ANG PAO. Moving around the dragon in varying sharp dance patterns were a pair of Chinese lions held by two dancers hiding under the beasts’ colorful head and body. On one part of the dance, one of the two lions would reach for an ang pao, a small red envelope with luck money. MONEY ENVELOPE. The ang pao is given to children on Chinese New Year to keep evil spirits away from the children and ensure them a peaceful new year. Traditionally, the money placed inside red envelop should be in even numbers since odd-numbered values are given in funerals. EPILOGUE. As we strolled around Chinatown, we saw different groups of lion dancers performing in smaller packs, each with their own percussion team. They too demonstrated the dance that drives away bad spirits and bring forth good fortune and a peaceful new year. BINONDO NEW YEAR’S EVE. It is a tradition among the Chinese community in the country as well with some Filipinos to have items believed to herald good fortune and prosperity all set for the celebration of the Chinese New Year. In Binondo, vendors make sure that all sorts of decorations, charms, figurines, trinkets, fruits, crops, and delicacies were made available for those who practice Chinese New Year rituals and traditions. To experience the way the Chinese-Filipinos prepare for the most important festival of the year, we visited Binondo on Chinese New Year‘s eve. WEALTH MAGNET. Although we’ve been to Binondo several times before, we have not seen it as crowded and as vibrant as it was during the eve of Chinese New Year. The stores lining the entire stretch of Ongpin spilled out their assorted merchandise on the street. Most vendors in makeshift stalls sell wealth symbols, usually gold charms tied in red silk cords with red tassels. Symbols like a round fruit, gold ingot, pineapple, fish, and gold coins are believed to attract wealth. They are hung up on doors and windows at homes and offices, and even in cars to summon money as if magnets for wealth. LUCKY CHARMS. There were trinkets to be worn as amulets in form bracelets, rings, and pendants. These are believed to protect the wearer from bad omen. It was also along Ongpin Street we found different figurines the Buddha and the sacred animals of the Chinese zodiac as well as mythical creature like the phoenix and dragon. They are some of the interesting merchandise laid out on long tables in stalls attended by Chinese vendors. MYSTIC KNOT. We learned some feng shui tips from the vendors themselves. When we asked which of the charms is the most effective in bringing endless fortune, one vendor recommended the mystic knot. The mystic knot is a series of six figure eight knots. It is a symbol of infinite and endless abundance with no beginning or end. It is made of a red silk cord tied through coins, charms, and other symbols of wealth. In feng shui, it is a common practice to combine wealth symbols with other charms to manifest its potency depending on certain considerations like physical location and ones zodiac sign. WHAT’S IN A FRUIT BASKET. One important Chinese tradition is to have a fruit basket during the celebration of Chinese New Year as it is a harbinger of all good things from heaven. Fruits like the kiat-kiat, small oranges were known to symbolize solid wealth as well as pears which represents smooth life. ONG LAI. A pineapple should be at the center of this basket as it stands for good luck. In Chinese, it is called Ong Lai, which literally means prosperity comes. It is believed that the more number of heads the pineapple has the more prosperous the New Year will be for the owner. The pineapple must be a highly regarded symbol for wealth that wreaths with the fruit surrounded by kiat-kiat were sold everywhere along Ongpin and even narrow alleys like Carvajal Street. For us, the pineapple wreath is a another kind of folk art similar to the Lenten Palaspas and Christmas Parol. TARO FOR BUSINESS. Not only tropical fruits of different texture, sizes, and shapes are used as wealth symbols, even the odd shaped taro root crop with branches sprouting from one source signifies the flourishing of the family and the growing of business. TIKOY. Another Chinese New Year treat is the glutinous tikoy which is sold in different sizes, flavors, and prices. The Chinese believe that eating tikoy symbolizes family togetherness. EPILOGUE. Naturally, a trip to Binondo meant going home with a bag of good luck fruits, boxes of sticky tikoy, packs of fried siopao and hopia, and assorted prosperity charms -treasures from one of the world’s oldest Chinatowns to be shared with those we want to entice to go with us the next day for Binondo’s Chinese New Year Celebration. 9th CENTURY A.D. As perpetual travelers, unwilling to miss any of the sights, we’ve got used to read up on what is there to see in places we would be visiting including its history. So here is about Binondo, Manila’s Chinatown. We can trace Binondo’s history to the 9th century, when Chinese traders would sail to Maynilad from Cathay, where their vessels dropped loads of valuable merchandise like silk and pottery and returned laden with sugarcane, hemp, coconuts, and other local products. But the mass migration of the Chinese to Manila began in the 16th century when the Philippines was already the colonial capital of Spain in Asia. HIRING SKILLED CHINO. Alarmed with the rapid swell of the Chinese immigrants and the Sinophobia (fear of Chinese) set off by the Limahong invasion and the murder of Governor Gomez Perez Dasmariñas, the Spanish colonial government decided to restrict them to a ghetto. But why did the Spaniards keep the Chinese in the colony despite of the risks of insurgence? Because they needed the skills and expertise of the Chinese as painters, scribes, tailors, carpenters, masons, smiths, butchers, cooks, printers, and accountants in developing the new colony. OLD CHINESE QUARTERS. The Chinese ghetto that became known as Parian first took shape on the bank of the Pasig where the Chinese traders did business. This colony was later moved in Intramuros, near the convent of the Dominicans, who had been in-charged of converting the Chinese. The Parian was moved some ten times from the Walled City to Ermita to the island across the Pasig from Intramuros called the Isla de Minondoc. MINONDOC. On March 28, 1594, the adjoining island of Minondoc was annexed to the village of Baybay or what is now the San Nicholas District. The island’s original owners, Don Antonio Velada and his wife Doña Sebastiana del Valle sold it to Governor General Luis Perez Dasmariñas (son of the slain governor), which he donated to the Christian Chinese community. This land-grant for a Chinese colony reserved strictly for Chinese Christians was to become the Arrabal of Binondo, which in two centuries would become the richest town in the Philippines. BINONDO CHURCH. By the 1640s, Binondo boasted of a stone church with 50 large windows and adorned with elaborate tapestries and paintings. This church was destroyed during the British Invasion but was rebuilt in greater splendor as its residents, a mix of native and Chinese mestizaje, grew in wealth. Its annual fiesta on the last Sunday of October in honor of its patroness, the Nuestra Señora del Santo Rosario, was said to rival the grandeur of Intramuros’ La Naval in olden days. The current Baroque church was rebuilt from World War II-ruins and has been re-dedicated to the first Filipino saint, San Lorenzo Ruiz, who served as an altar boy before being martyred at Nagasaki in 1637. PLACE CALDERON DE LA BARCA. Across Binondo Church is Plaza Calderon de la Barca, which was one of the most impressive open spaces in old Manila. It was named as Plaza de Binondo, then Plaza Carlos IV, before it was named after the Spanish playwright, and later as Plaza San Lorenzo Ruiz, whose statue dramatically stand on the plaza. The Chinese called it Hue Heng Khao or at the foot of the garden because the plaza was lined with plants and trees with Baroque fountains at either ends. The Binondo Church, Hotel de Oriente, and La Insular Cigar Factory were the plaza’s principal landmarks before World War II. ONGPIN. The street at the right side of the church was formerly called Sacristia, after the sacristy entrance of the church. In 1915, it was renamed in honor of businessman and philanthropist Don Roman Ongpin. His bronze monument at the entrance of the street serves as reminder of his patriotic role in Propaganda Movement and the first Filipino to wear a barong tagalog during public occasions. The kilometer-stretch of Ongpin Street is lined with restaurants, cafes, apothecaries, curio shops, jewelry stores and goldsmith, and religious shrines. One side street shrine is dedicated to the miraculous Sto. Cristo de Longos. STO. CRISTO DE LONGOS. One of Binondo’s legends revolves around the venerated image of the Santo Cristo de Longos. The story goes that a deaf-mute Chinese miraculously regained his speech when he accidentally found the blacked image of the crucified Christ at the site of an old well in the barrio of Longos. The cross was installed at the Church of San Gabriel where it became an object of devotion among the people of Binondo. The image was transferred to Binondo Church where it is enshrined to this day on a glass-covered niche near the side entrance of the church. Another shrine located in San Nicholas district was built on the site of the old well where the miraculous image of Christ was found. STREET SHRINE. But there is another shrine of the Sto. Cristo de Longos tucked in one of Ongpin’s side streets where devotees come to make offerings and burn joss sticks in a manner seen mostly in Buddhist temples to a large crucifix covered with leis of sampaguita. EPILOGUE. This is what we like best in Binondo, the happy blending of East and West. EAT YOUR WAY AROUND BINONDO. 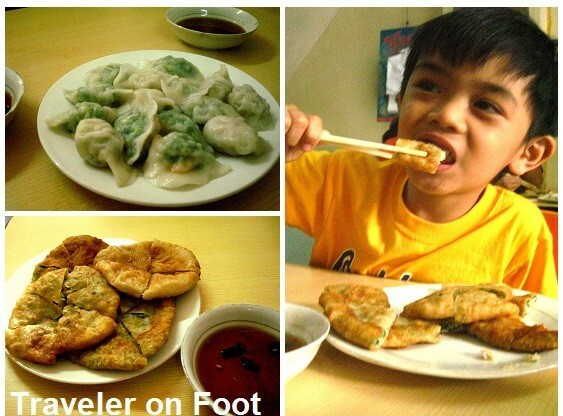 If one knows where to look, Binondo can be the ultimate foodie adventure. The offerings can be as trendy as sipping caramel latte at Starbucks near Plaza Calderon de la Barca or as traditional as eating dimsum in one of Chinatown’s famous holes-in-the-wall. 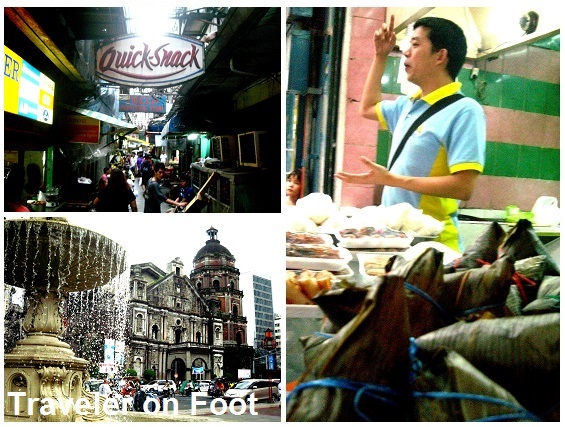 More than history and culture, a trip to Binondo is about food. OLD MANILA WALKS. 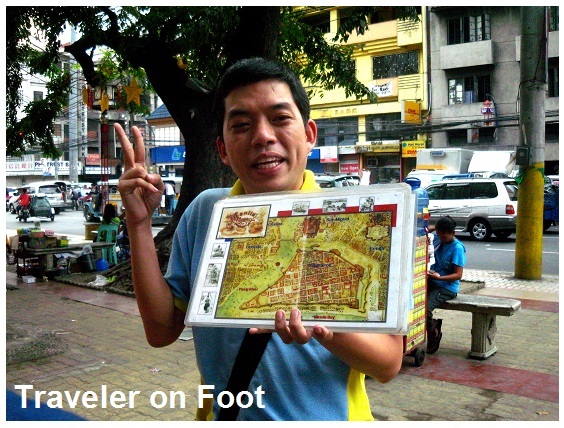 Ivan Dy, Old Manila Walks’ celebrity tour guide and an authority of things about Manila introduced us to some of the eateries and delicacies in the district he knows and loves so well. It was our second time to join Old Manila Walks. Two years ago, Ivan led us to an engaging Afternoon Stroll in the San Miguel District where we awed at the all-steel gothic marvel of San Sebastian Church and experienced a fine-dine merienda at the Legarda Mansion. One of the things we like about walking tours with Ivan is that we learn well-researched trivia about the things we see, smell, hear, touch and taste while in the trip. This time we experienced nibbling around Manila’s Chinatown through the wildly popular BIG Binondo Food WOK. TSINOY COOKING. Food tells much of a place’s history, geography and peculiarities. In Manila’s Chinatown, the cuisine has all the multi-cultural features of Tsinoy cooking –basically, Chinese with Spanish and Filipino underlay. According to Ivan, most of the Filipino-Chinese or Tsinoys were descendants of the early Hokkien (or Fookien) immigrants from the Fujian province in China. It was in Isla de Binondo, a tract of land across Intramuros where most of the Chinese immigrants settled during the Spanish rule. The Tsinoys introduced an exhilarating mix of Asian ingredients and variations in food preparation that influenced the Filipino food taste. Peculiarities rooted in tradition created a unique food culture that has become synonymous to Binondo. BINONDO FLAGSHIP DISHES. When one goes to Binondo, he is expected to bring home packs of sweet Hopia as pasalubong. This delicious pastry to die for consists of thin, flaky layers of smooth dough with monggo (mung beans) paste or mashed ube (purple yam) as filling. We’ve learned from Ivan that in the olden days, mongo and baboy (lard) were the only hopia varieties available. Today, the hopia comes in langka, pastillas, quezo, and macapuno flavors. Another Binondo flagship dish is the siopao or steamed pork buns. 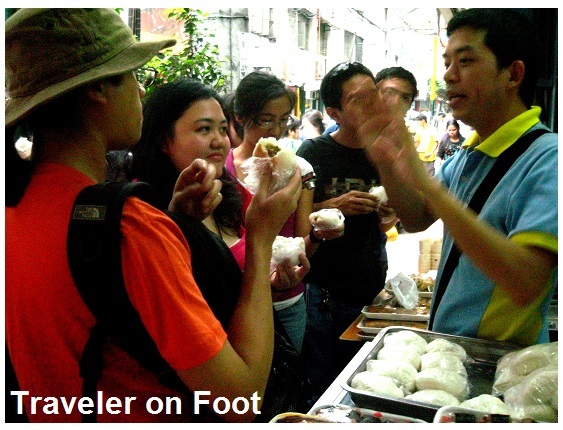 Ivan guided us along a labyrinth to a stall that caters to over 100 siopao lovers a day. This little stall served us fried siopao that was swiftly heated in a frying pan. What makes this siopao special and worth the hunt were the soft, silky soft bun and the succulent meat filling. OLD BINONDO DINING NOSTALGIA. Dining in Binondo is nostalgic of old Manila. During this culinary tour, we experienced dining into a themed-café, a cozy restaurant and an unassuming hole-in-the-wall joint. Firemen hats hang on the wall of Café Mezzanine as it pays tribute to centuries of volunteer Fire-Fighting in Old Manila. We’ve learned from Ivan that a portion of the customer’s bill goes to a foundation supporting the volunteer fire-fighters. Northern style dumplings are freshly made before the customer’s eye at Dong Bei Dimsum. In this hole-in-the-wall joint, we sampled tasty dumplings while Ivan educated us about its origin and how it got to the Philippines from Northern China. LUMPIA AND ART DECO. New Po Heng Lumpia is set amid a homey ambiance in the Art Deco-inspired Uy Su Bin Building along old Calle Rosario. Here we were served with Hokkien style lumpia or spring rolls made up of slivers of carrots, lettuce leaves, dried seaweed and a pinch of crush peanuts bundled together in lumpia wrapper with a compliment of sweet sauce. FEAR FACTOR CHALLENGE. People from the Canton were known to eat everything in their midst especially when it moves. What others may find exotic was a common fare in this Chinese province today known as Guangdong. In our culinary tour of Binondo, Ivan dared us to try a Cantonese delicacy that looked like a chocolate flavored dessert. Everyone in the group had their own reactions after taking the first bite. EPILOGUE. For us, sampling the familiar and not so familiar taste is what the Big Binondo Food Wok adventure was all about. But for those who are less adventurous about trying unfamiliar food, McDonald’s has several branches in Binondo.